The FDA recently OK’ed the use of genetically modified salmon for consumption, making the “frankenfish” the first GMO animal approved for sale in the U.S. market. And the freakiest part? Vendors aren’t required to label genetically engineered salmon as such—meaning your spicy tuna roll could be loaded with the lab-created fish. “It’s very scary from a consumer perspective,” says Jen Scott, Marketing Director of the Portland, Ore.–based brand Fishpeople. “People are wildly confused about which questions to ask before making a purchase.” Without mandatory labeling, the confusion will only intensify according to Scott. While the potential health risks associated with eating genetically-modified fish aren’t yet known—the FDA maintains that GMO salmon meets its regulatory requirements and is safe to eat—it’s this lack of transparency that smaller seafood companies like Fishpeople are determined to fix. According to Scott, there are two main things anyone shopping for fish should know: “Where the fish came from and how the fish was caught.” But when shopping at traditional supermarkets, aside from consulting third-party experts like Seafood Watch, finding this information can be tough. If you can’t get to a local fishmonger, buying from Fishpeople might be the next best thing. 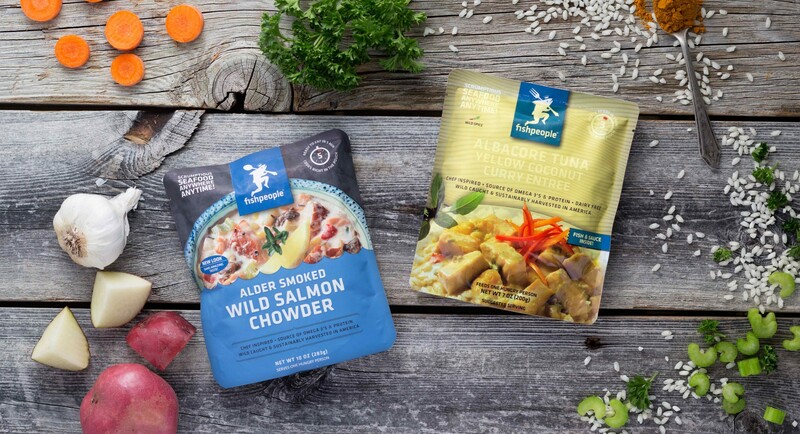 The company—which specializes in packaged, sustainably caught seafood dishes like Dungenesse Crab Bisque and Alder Smoked Wild Salmon Chowder—is built around the idea of connecting customers to food producers. The way it works is so simple: on every pouch, there’s a tracking number. You visit the the company’s Track Your Pouch tool online, enter the code, and instantly get the chance “meet” the fisherman and farmers who harvested the ingredients, in the form of videos and photos. Yep, we wish this tool existed for every packaged food we eat! For example, you might follow the incredible journey of a wild-caught albacore tuna from Japan to Alaska to Oregon, where it was caught 40 miles offshore before landing on your plate—and meet the fisherman who caught it, Captain Scott Kastengren. Check it out for yourself in this video, and shop Fishpeople right here on Thrive Market.